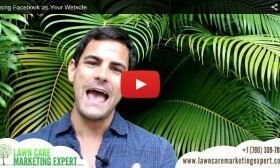 But before I do… Don’t forget to subscribe to the Lawn Care Marketing Expert Youtube channel and visit lawn care marketing expert.com to subscribe to my weekly marketing tips. So me and Jonathan agree that the number one reason to learn how to program is because it teaches you how to think logically and forces you to learn serious problem solving skills. 1. You have to think through every single line of code (steps) in order to make the program work (reach your goal). This in applicable to every aspect of running a business because running a business is essentially solving a series of problems. EX: how to get customers, cash flow, hiring the best people, etc..
2. You have to sit there for hours and hours and hours banging your head against the wall, figuring out a solution to a problem. (how to best write the code to make the program work). This requires, research and reading on the internet and manuals until you find a way. It also requires discipline to work through the pain of figuring it out. Every business requires you to do many many things you don’t love in order to make it a huge success. I discovered these things when I taught myself how to program almost 16 years ago. And although my team does all of the programming for me now – the way I think about how to accomplish my goals, has been transformed forever. If you have any children it is a “second language” they would greatly benefit from as well. Thank you Narian. Keep taking action and improving your business. Virgin Unite is probably the charitable organization I have supported the most. The other main ones are the Rush Philanthropic Organization and Leukemia & Lymphoma Society. I will be raising funds to build housing in Haiti later this year. They are still devastated from the hurricane years back. I could definitely use your help with that! Stay tuned! What program class could I start taking or what would one potentially be called online so I could start? Michael, are you asking what programming class you should take? I would start with a C#, Java, PHP or Ruby on Rails if you want to teach yourself and/or Intro to Programming 101 if you take a college course.